As promised, here is a recipe for whole wheat chocolate chip cookies. What I like about these cookies is the mix of nutty flavors from the wheat pastry flour and walnuts. The evaporated cane juice crystals seem to add a little flavor too. You could substitute granulated, but the cookies are actually better with the crystals. Preheat oven to 350 degrees F. Have ready a couple of cookie sheets. Stir together the flour, baking soda and salt; set aside. Beat the cold butter with an electric mixer until creamy. Add both sugars and beat for another 2 minutes, scraping down sides of bowl. Beat in the vanilla and egg, beating only for about 30 seconds. By hand, stir in the flour mixture. When flour is almost incorporated, stir in the chocolate chips and walnuts and stir until flour is completely mixed. Drop by rounded tablespoons and bake for 12 minutes on ungreased cookie sheets. Anna, If I could I would hug you! Woo HOO!!! I have been substituting and altering choc chip cookie recipes for almost 14 years. They are always hard lumps…dry…or extremely coarse crumbly things we end up using for sling shot practice! Well, I have never gotten any where close to what I call a GREAT rendition. Until…NOW. WOO HOO ANNA! I did line my cookie sheet in shiny foil and sparingly apply coconut oil*( a good choc cookie should be both chewy and yet have a crisp bottom). I Shaped dough into about one heaping tablespoon sized balls, slightly flattened them before the oven, baked at 350 for 9 and was so amazed! The results are fabutabulous! The appearance is close to a toll *ouse cookie. The texture is of course just a tad more whole grainy, but not DRY…not at all. The flavor is superb…the aroma is as well. All in all, it is a great cookie experience. Crisp bottom, a chewy middle, slightly melty chips, maple flavor…it is so wonderful to have cookies to make for the holidays. I am jumping for joy! I thank you from the bottom of my cookie jar. Truly. No more tears for me after hours of experimenting! (I will confess I plan on buying maple crystals and adding them in next…but no further tweaking will I attempt. I promise!) Perfection! WOO HOO! Bless you woman! Bless YOU! I love Fuzz’s picture of Garfield. I’ve been using this WW chocolate chip cookie recipe for years: http://www.sugoodsweets.com/blog/2005/11/imbb-21-cookies/#cc-cookies. Similar to yours but with more sugar. I like the idea of the cane juice crystals and will try it next time I prepare a batch of chocolate chip cookies. Did these come out crispy or soft bu the way? Here’s another review. I made them yesterday–and they are great! I thought mine were a little thinner than yours, but looking again, I don’t think they are. I left out the nuts (CRAZY! ), but only so my kids would eat more of them instead of me. Julie, I can understand your husband’s view on walnuts. Sometimes they do taste that way. I think it’s from the tannins in the skin. Maybe he perceives the dryness as dirty tasting? My stepmother does. In fact, she always boils her walnuts before toasting them. I’ve boiled walnuts a couple of times and it does give them a “cleaner” flavor. I throw them in a pot of rapidly boiling water for about 3-5 minutes, then drain, pat dry and toast. When I don’t boil them, I toast them and rub off the skins while they’re hot. But to answer your question, pecans would be great! So far, these cookies have received great reviews from my tasters. 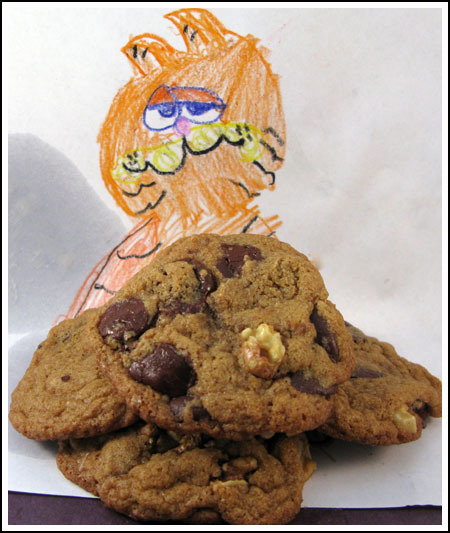 When I was here at Cookie Madness earlier I meant to say that’s such a cute drawing of Garfield, and I just read your comment about how Fuzz’s interest was piqued without prompting from you. That’s interesting. love the whole wheat…did u know u can use olive oil instead of butter? still, if your cookies were here i’d certainly love to taste two. In fourth grade, I was really into Garfield. Obsessed, actually — and not just because he introduced me to lasagna, which was a strange and exotic food for me at that time. Now 30 years later, my daughter is into Garfield without any prompting. She went to a friend’s house, read a Garfield book, and was hooked. Maybe scientists should do a study to see if there’s a Garfield gene. CUTE Garfield drawing. I used to draw him all the time! You’re so talented, Anna. Oh, okay, it’s probably Fuzz. Good job, Fuzz! You KNOW I’ll try these cookies. It’s a lot different from the recipe I have. Mine has more sugar (both kinds) and more flour and I think it has soda and powder.